McMillan is ushered into menarche with flowers, rainbows, and bullet points. CLEARWATER, KS—Sitting alone in the school nurse's office, local student Vanessa McMillan, 12, was welcomed to the most beautiful and special time in her life Tuesday by a four-page educational pamphlet. McMillan, who became a woman midway through a unit five geography test and, moments later, rushed to see the school nurse, was reportedly congratulated by the three-color pamphlet at approximately 11:35 a.m.
"Welcome to the wonderful world of womanhood," read the informational booklet, which was handed to the distressed sixth-grader just after she entered the white-walled office and hesitantly explained the magical transformation that was taking place. "This is a time of incredible change!" Over the course of the next 20 minutes, McMillan's passage into womanhood was heralded by the pamphlet's front cover design of a yellow daisy in full bloom; a series of bold-type chapter headings, including "How Am I Different Now?" and "What To Expect Each And Every Month"; explicit line drawings of a large, two-dimensional uterus; and the deafening silence of school nurse Mrs. Howards, who had busied herself with checking e-mail and filing paperwork. "Cramps are a natural part of your new monthly visitor," a sentence halfway down the first page read, one of roughly a half dozen upbeat mentions of menstruation-related discomfort that greeted McMillan as she reached her amazing milestone. "Don't worry. In just a few short years, they won't hurt as much as they do now." 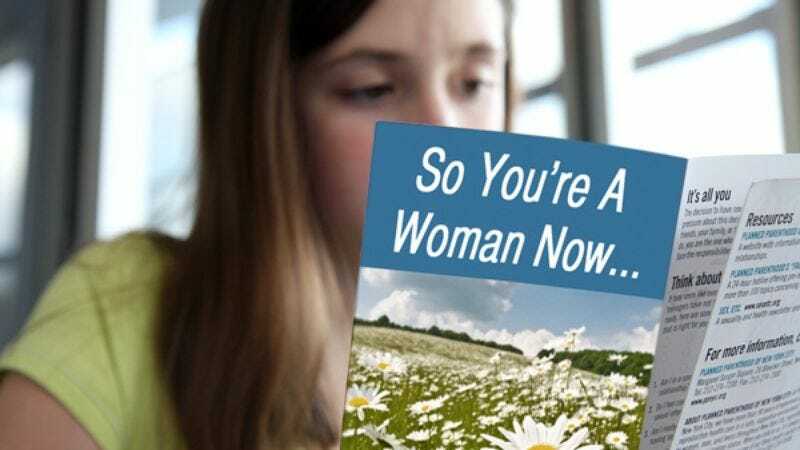 The pamphlet—with its monthly cycle charts, unexpectedly frightening illustration of a butterfly emerging from its cocoon, and repeated use of confusing terminology—wasn't the only thing to welcome McMillan to the newfound joys of womanhood. Approximately six minutes after receiving the document, McMillan's breathtaking metamorphosis from little girl to sexually mature female was commemorated with a large absorbent pad, wrapped in hospital white and handed to her by Nurse Howards. "You'll have to wear this now," said Howards, placing the foreign device onto a chair next to McMillan. "And there's some extra pants in that bin over there, if you need them." According to middle school sources, congratulations extended far beyond the nurse's office. Over the course of the day, McMillan's budding womanhood was acknowledged by passing teachers who smiled sympathetically upon seeing her; a group of sixth-grade boys who warned one another not to talk to her for fear she might suddenly become pregnant; and Coach Dobbs, who suggested that she should maybe go ahead and sit out the afternoon's gym class. McMillan was also warmly received by her circle of friends, who demanded that she tell them everything that had happened, including what it was like, how she was feeling, and whether or not she was going to ask Jeremy out to the dance this Friday now that everything was different. "Oh my God," best friend Rebecca Woolard screamed as she gave McMillan a hug that seemed to contain faint traces of jealousy, competitiveness, and what almost felt like resentment. "You have no idea how lucky you are!" "I so totally hate you right now," Woolard continued. "Totally, totally hate you." Following a whirlwind day of firsts—including the first time in a long time that she felt scared and overwhelmed and desperately wished that her mother had picked up the phone when she left midway through class to call her—McMillan returned home at approximately 3:30 p.m.
At 3:37 p.m., the sixth-grader received one last, very special welcome. Seated alone in her bedroom, McMillan was greeted by her own reflection in the vanity mirror, a reflection she examined for several minutes and searched endlessly for any sign of a change.